is not ideal for farmers. Let our universal, open rim, gauge wheel be the solution to your problem. My name is Jacob Smith and I farm with my brother Matt and our dad Duane, in northeastern South Dakota. Like other farmers, we began no-tilling in the early 1990's. The combination of no-till and living in the prairie pot hole region caused frequent wheel plugging. This resulted in delays, repairs, and stress! We were sick and tired of having to constantly clean out the wheels on our 1890 John Deere Disc Drill and our 24 row Kinze Planter. We knew that there had to be a better solution out there. After searching the market for a while, we realized that nobody had thought of a solution to this nagging problem. So we decided to come up with our own solution by going to the root cause of the problem: gauge wheels that were poorly designed for our soil conditions. We wondered if cutting holes in our closed OEM rims would allow the heavy clay and wet mud to flow right through the rims and not plug them up. So we tried cutting holes into the rims and found that our theory about the holes was correct. However, the OEM rims were not strong enough without support and they folded up within a few acres. We realized we were onto something big though. Our next design was a reinforced steel spoked rim and we quickly pinpointed a few more areas where we could improve on the OEM wheels. The bearing system was improved by using a cast iron hub, which eliminates the wheel wobble found on most OEM wheels. The rubber is also better on our wheels because we created our own. Farmers have told us that our rubber lasts up to 20% longer than most OEM rubbers. Pretty soon we found ourselves making lots of wheels and we quickly outgrew our shed. So we did what every good farmer does and built a newer bigger shop to expand our operation. 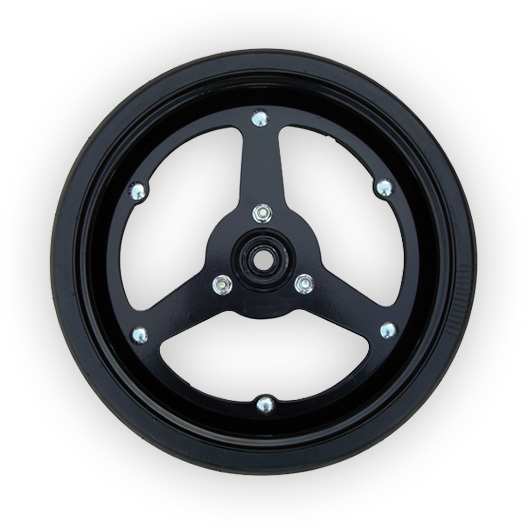 Over the last 3 years we have been manufacturing and selling wheels by the thousands. We've sold over 10,000 per year in these past 3 years and have sold over 100,000 since we started in 2008. My family and I work hard all winter long to service our customers, who are farmers just like you. We feel good knowing that we save farmers time, money, and stress. "We were on the field days ahead of everybody in our area. The reason being, we had your gauge wheels on our air drill." "We were thinking of trading our air drill because we had so many problems with gauge wheels getting plugged up. We were spending as much time cleaning wheels as seeding. So we gave it one more try and changed them over to your gauge wheels. We didn’t have problems again! Thanks." just fine, except for the existing gauge wheels. are you going to be on the field when it's the ideal time to seed? Get the best upgrade that you could possibly get for your gauge wheels.